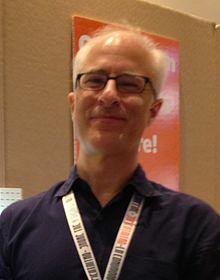 David Rudman (born June 1, 1964) is an American puppeteer, puppet builder, writer, director, and producer known for his involvement with the Muppets and Sesame Street. David Rudman has been a Sesame Street muppet performer since 1985—currently performing Cookie Monster, Baby Bear and The Two-Headed Monster. He has received four Emmy nominations as Outstanding Performer in a Children's Series for his work on Sesame Street. Rudman took over as Frank Oz of the Cookie Monster, and Richard Hunt's half of the Two-Headed Monster, Scooter, and Janice of Dr. Teeth and The Electric Mayhem after Hunt's death. Other characters he performs are Sonny Friendly, as well as Sully to Jerry Nelson's Biff, the construction workers. He has written and produced cartoons for MTV, Disney Channel, and Comedy Central. Rudman was the speaker at the 2005 graduation ceremony for the Illinois Institute of Art—Chicago.